On the twelfth day of the twelfth month of the twelfth year of the century twelve Ooters gathered for their Wednesday walk. What a great introduction to today’s walk this would have made but even as yours truly was composing it, Andy arrived to swell our number to thirteen and destroy what would have been a great introduction. Anyway, we hung around in the frosty sunshine at the Gogo Burn car park in Largs until we were sure that nobody else was arriving then we set off for a walk that was new to most of us, to Rowantree Hill and back. Here are a couple of pictures of the Ooters before the weather began to deteriorate. There was a good turnoot of Ooters (Alan, Allan, Rex, Davie x2, Paul, Ian, Robert, Ronnie, Malcolm, Johnnie) at the car park at Greenan Shore for an Ooters' favourite (perhaps because it's relatively short), the ascent of Brown Carrick Hill. More pictures from an excellent day on Millport. When is an agreement not an agreement? Apparently it’s when it’s made by a bunch of merry Ooters in a pub on a Wednesday afternoon. 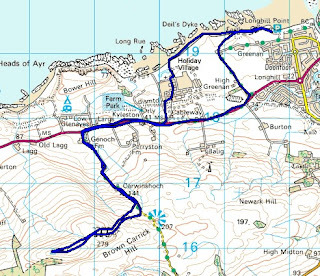 While some, including yours truly, thought that an agreement had been reached that we follow Davie’s suggested horseshoe route on Cumbrae, others had different ideas. Oh dear! 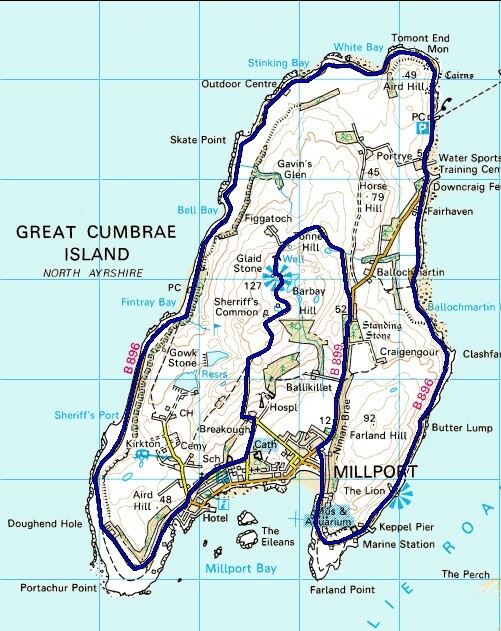 What was accepted by all though, is that we were going to Cumbrae again. So on a late November morning with clear blue skies, frost-rimed trees and still, frosty air, ten of us gathered at the slipway in Largs. It must have been on the ferry that an arrangement had been made for when three of us turned southward from the slipway on the island, seven others turned northward. They were for a shorter walk round the island while we were for the horseshoe. Here was another schism. However adamant the seven were, the three were determined to do their own thing. The sky was clear and the late November sun was beginning to take the chill from the air as we strode out along the shore road towards Millport. Birdlife was plentiful along the water’s edge though there was nothing out of the ordinary. A seal popped its head out of the water to watch our passing and a buzzard ‘meowed’ above the tree to the inland. And the sun still shone. The few miles from the slipway to the outskirts of Millport were covered without us really noticing the distance. 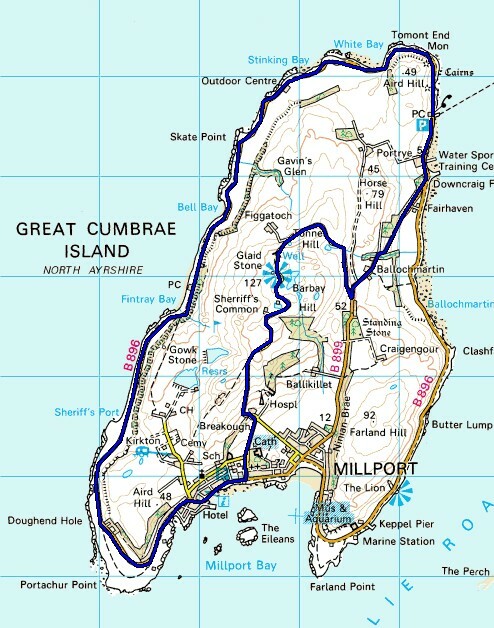 Then, on the outskirts of Millport, we turned away from the shore and started the climb inland. As we came along the shore, a bank of thin cloud had been gathering and now this came between the sun and us. But this didn’t stop our enjoyment of the walk. Indeed it probably kept us cooler for the road now rose towards the highest point of the island at The Glaid Stone and the effort was warming. And, as we rose the landscape opened out for us. Firstly it was across the water to Largs and the Ayrshire coast but when we reached The Glaid Stone we had the whole panorama of the firth of Clyde before us. We stopped at The Glaid Stone for a bite of peece and to take in the view. To the east was the Ayrshire coast running southward to the Galloway hills showing blue in the distance; to the south lay the expanse of the firth with Ailsa Craig providing a stop on the horizon; to the southwest the rugged mountains of Arran looked particularly Alpine with their caps of fresh snow; to the west lay the low-lying Isle of Bute with the hills of Knapdale beyond; to the north the firth ran up into the snow-covered mountains of Cowal, Arrochar and the Lennox, Bens Lui, Ime and Lomond were the landmarks; altogether a superb view for so little effort. And the sun blinked out again. Paul attempted to capture the whole panorama with the camera and we look forward to seeing the results. But the November air was beginning to chill and we moved on. Down from the Glaid Stone we came, down into Millport. As we did so the sun made a re-appearance and by the time we had dropped to the town, the day was warming again. Jackets were removed for the first time today. 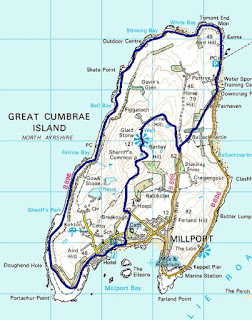 We walked south-westward through Millport enjoying the warming air. What we hadn’t realised at that time was that we were sheltered from the northerly breeze that was beginning to stir. When we rounded the corner at The Lorn we found to our discomfort that this breeze was now in our faces. But the sun was warming and the pace brisk and we could tolerate the chill for a wee bit yet. Eventually, though, the jackets had to be put on again. The pace was kept brisk until we reached the tearoom at Fintry Bay where a halt was called for another cuppa. That was where Davie announced that there was no three o’clock ferry. It was now twenty past two so we had more than an hour to cover the last couple of miles or so. We took our time, enjoying the views, watching submarines and warships and ferries come and go on the firth and admiring the aeronautics of a couple of buzzards. We arrived at the slipway at three o’clock by which time we knew that the seven had been in the pub in Largs for half an hour already. We look forward to hearing a report of their day. When is a compromise not a compromise? ……When there is no compromise. With Johnny having been warned off another big walk by she who must be obeyed, with Robert still tired after a weekend of plasterboarding*, and with the rest of us happy enough with the usual walk, we took the anti-clockwise route round the island in, what to begin with, was a raw and overcast morning. By 11.15 we had reached the Fintry Bay Café (closed for the winter) and had coffee on the picnic benches by the beach. Since we were cooling down quickly we did not delay and were soon on our way. We had decided not to follow the path up to the golf course but follow the road round to Millport as keeping the feet dry was a desirable outcome. By the time civilisation was reached the sun had come out, blue skies were above and the world was a better place. Lunch was taken at the shelter next to the football pitch whilst the views were enjoyed. Many a morsel was offered in expectation that Holly would be there for her snacks but, alas, Davie had her tellt that she was to show him the way today. We had to eat all our food ourselves. How we missed the dug! Some discussion took place as to whether we should then have a coffee in the Garrison but it was too soon after lunch so we continued up past the Cathedral of the Isles and made the steady climb up to the Glaid Stone. On our way we observed our second submarine of the day as it made its way down the Clyde deciding they hadn’t been Trident boats as they were too wee. Glaid Stone allowed us terrific views up towards Ben Lomond and the Arrochar Alps and it confirmed our notion that, on a day like this, Scotland cannae be beaten. was starting to go down in the west and the temperature was dropping again. We therefore reached McCabe’s in Largs for our FRT an hour before Davie, Jimmy and Paul joined us. *This is a new sport to rival skateboarding and snowboarding. Unfortunately, the technology has not been fully developed yet and there is still too much friction between the plasterboards and the ground, hence Robert being so tired. He did complete the course without the aid of a helmet or knee pads but kept his stabilisers on for the first hour. Next week he is going to raise the ceiling by doing a dry wall run down the Gyprocs. For the first time in weeks the weather gods were with us when we assembled at the car park between Ardrossan and Seamill for today’s walk. 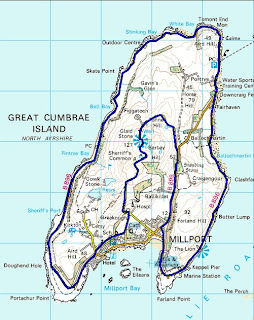 We’ve done the Portencross Circular on numerous occasions and have done Ardrossan to Seamill as part of the Ayrshire Coastal Path but combining the two, in order to give us a longer walk, was to prove challenging, particularly as it was Johnny’s (aka Zippy) return to the fold after brain surgery. We are happy to report that the surgeon found nothing*. 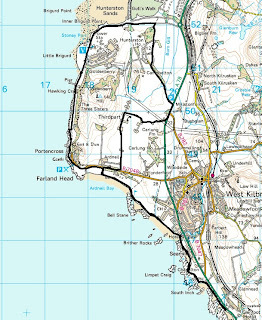 Paul’s recently posted route map shows the path taken, but it should be reported that there was yet another schism as one group took to the shore and another to the pavement before coming together just beyond the Hydro and joining the path next to the golf course before stopping for coffee just short of Portencross Road. The golf course, it has to be said, was in great condition considering the recent deluges and was being enjoyed by many a golfer taking advantage of the late autumn sun. Coffee finished, we took the anti-clockwise route along the road and up to Thirdpart Holdings, noticing a new house being built and trying to ascertain the progress with the big house that seems to have been under construction for years. Hedge cutting tractors had to negotiated, as were a couple of horsewomen making sure that their mounts weren’t spooked by a gaggle of recently retired professional gentlemen. Soon we reached the main road and turned almost immediately back on to the path taking us back to the shorefront at Hunterston passing the building with the Latin inscription (for which we couldn’t remember the translation) on the clock. Lunch was taken atop what looked like a sewer pipe, hopefully now defunct. We can pick the spots, so we can! This was a break in tradition as lunch is normally taken at the rocks just beyond the power station but you’ve got to live a little and be adventurous at times! Jimmy had his binoculars out by now, they can’t touch him for it, and was actively looking for the bird life. Ronnie suggested the late night bus home from Prestwick would provide greater opportunity but might steam up his lenses. As we moved past the power station and followed the new part of the road before joining the path through the fields beneath the cliffs, we realised what had been missing from this walk today…glaur! Undaunted, Portencross castle was reached and after checking whether it was open, it wasn’t, we continued up the road before retracing our steps down past the golf course and back on to the beach for the return journey. On reaching the Hydro, Johnny and Allan took to the road again whilst the rest continued back to the cars along the shorefront. This was a long walk (four and a half hours) and the last couple of miles from Portencross back to the car park proved challenging on the feet and legs. However it made the FRT at the Laurieston even more enjoyable. The only female allowed along - she doesn't object to the bad language. Gonnae throw that stick, gonnae? Allan, Paul, Rex, Malcolm, Andy, Davie M, Jimmy. 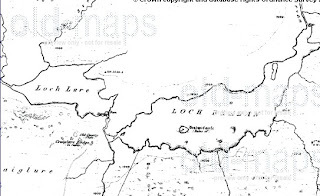 Kilmarnockians were conspicuous by their absence from this planned walk around Loch Bradan. Most, however, had submitted legitimate excuses. Rain, however, does not deter the hardy Ooters, and we set off as planned from Stinchar Bridger for our circumnavigation of Loch Bradan. From the start, Davie had made it clear he was not leading the walk, and no one objected to this. We made our way along the metalled road to the Loch. 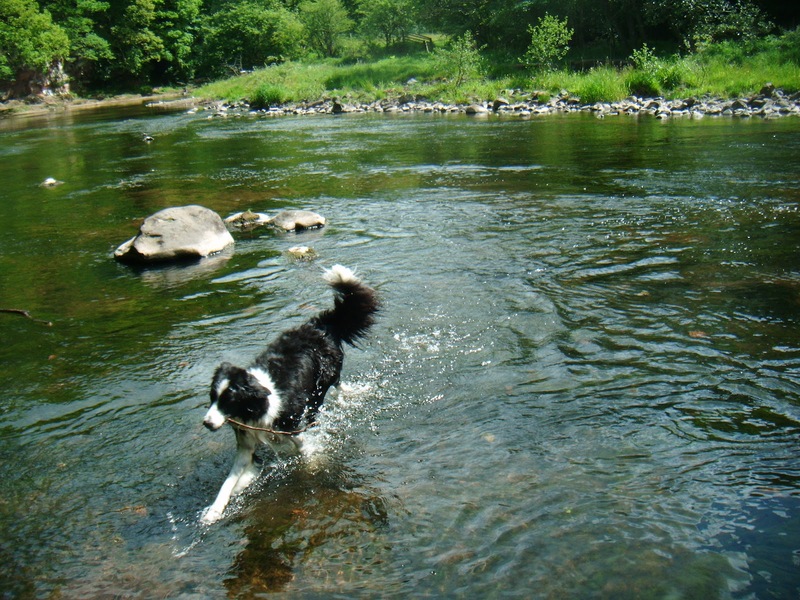 Davie threw a stick for Holly to retrieve from a swollen burn, which was flowing faster and deeper than had been anticipated. Somehow she managed to clamber out. The spelling of "Bradan" seems to be somewhat flexible and at the parking area near the loch the Forestry Commission sign announced "Loch Bradon". Hmm. There was some debate about which direction to go around the loch (boulders were mentioned), but before a vote could be taken Rex decided on our behalf that we would take the anti-clockwise route. To be fair to Rex, he is possibly unaware that Ooters actually take votes on important matters. He seems to miss them all. We sped along the lochside path, which we are more accustomed to following in the opposite direction, and with coffee time approaching we sought shelter. An old brick boathouse was investigated but it seemed no drier inside than out, so we continued on our way. We were now approaching the dam and Davie was reminded of his aborted attempt, with Robert, to walk along the top of the dam on our previous circuit. There was much mirth. We clambered over the gate to the base of the dam to see the spectacular sight of Loch Bradan's contents overflowing the top of the dam in a sheet of white water. "It's like a mini-Niagara" announced Paul, who has never visited said falls and might have been getting a bit carried away. Shelter of sorts was to be found on the window ledges of the buildings at the foot of the dam and coffee and the odd sandwich were consumed. No one had any memory of how we had crossed the torrent flowing from the dam outfall when last we had been here. "There must be a bridge" opined Jimmy. We retraced out footsteps a little and followed the cycle route sign down a track to the torrent. There was no bridge, nor had there ever been a bridge. It was a ford. It was an impassable ford. What must have been a benign crossing when we were previously here (Paul couldn't remember crossing it so it couldn't have been that daunting) was now an angry flood. Defeated, we turned tail, there being no alternative but to go back the way we came. However, we did stop to admire the monument to the good people of Troon, whose Burgh Council had the vision to build the dam in 1912 so that Bradan would provide pure water for the virtuous folk of that town. 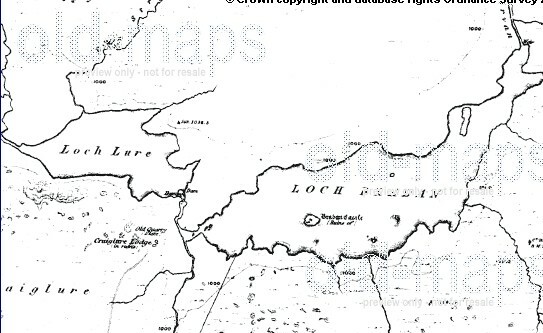 Davie informed us that there were once two lochs here - Loch Bradan and Loch Lure. And he was right. The building of the dam created a superloch and at the same time submerged the ruins of Bradan Castle. Rex and Allan led the way back, leaving the rest of the party trailing in their wake (what was in Allan's sandwiches?). But they kindly waited for the stragglers when they reached the metalled road, whereupon Rex, Davie and Paul tore off at speed. "Not a bad pace for three auld yins" said Davie as they approached the cars. And it wasn't. Oh, and Holly got a special mention for carrying the same stick all the way. It was good to get into dry clothes. Refreshments were taken at a new venue - the Kirkmichael Inn. There, we received a very friendly welcome from both staff and clientele and it goes on to our approved list of hostelries. Here are a few pictures from my recent visit to Mosset. They remind me of the weather The Ooters got on previous visits around this time. 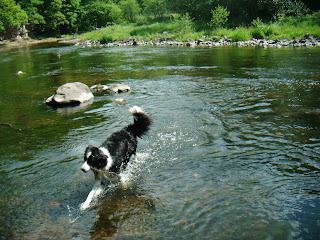 It was a shame I missed the Loch Braden aborted walk -swollen rivers and too much rain. No such problems in Mosset. 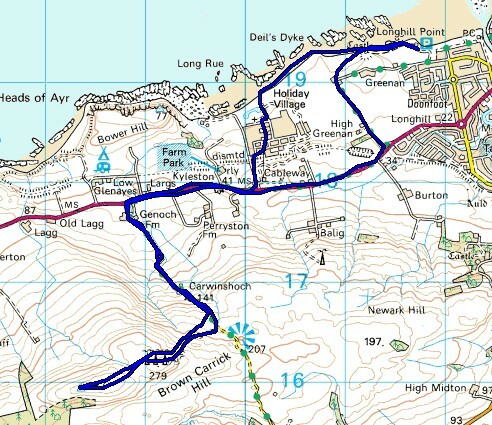 Robert had an idea for a new walk, a vague idea of a route across the Fenwick Moor from Whitelee to Fenwick. But, as we all know, vague ideas are no use to Robert and he had to make sure. To this end he went to ‘recce’ the walk on Sunday. All went well until half way through he was confronted by a seemingly endless morass of wet peat and lank, tussocky moor grasses into which any semblance of a path melted. With thoughts of another Black Craig episode in mind, he decided to abandon this route and amend the plan for today. That’s why twelve of us gathered at the meeting place in Fenwick on another dull, damp and dreich Wednesday morning. Now, despite protestations from Robert to the contrary, we suspect that he made an amendment to his amendment for we were not to start from Fenwick at all but to motor round to the hamlet of Waterside. At around the half-past-ten mark we were ready to leave the car park in Waterside. We started off along the road for Ga’ston. This is a busy road and we were only too glad to be leaving it after a few hundred yards to take a minor road that came in on our left, a quiet road that would take us past Collarie Farm towards Craigends. Well, we thought that it was a quiet road but often we had to step aside on to the grass verge to let traffic past. Still it was considerably quieter than the Ga’ston one and it took us deep into the east Ayrshire countryside. ‘Is this no’ the road into Kiwi Lodge?’ asked one. The answer was affirmative. A few memories were recalled of the famous howf of the nineteen-sixties and seventies although the more innocent among us claimed never to have heard of the place. And, just for old time's sake we took a look at the private house that used to be the infamous Kiwi Lodge Hotel. Then we retraced the steps for fifty yards or so and took the farm track for Airtnoch Farm. We thought that at last we had a road to ourselves but yet we had to step aside and let past first a lorry then a van then a tractor just finished spraying slurry. And we met the van on its return journey. So much for a quiet walk! (A quiet walk? With you lot around – Ed.) But we soldiered on. Just inside the forest we came across a splendid new house complete with tennis court. Called on the map Craigendunton, we wondered who on earth would want to build such a splendid new house inside a conifer plantation? If it was for privacy, they certainly got that but if it was for the view, all they can see is a sea of the ubiquitous Norway spruce. Still we wonder for there was no-one there to ask and it looked as though there had been no-one there for a wee while. We walked on. The road became rougher now that we were in the forest but it was still a road and it took us to the face of the dam that held back Craigendunton reservoir. This is in the keep of Kilmarnock Angling Club who stock it regularly and is familiar to Allan who has fished it and the surrounding lochs for many years. And, fortunately for us for now the rain was with us, the angling club have provided a shelter. An ancient, windowless, damp portacabin provided shelter for our elevenses/lunch while outside the rain fairly pelted down. Today though our return journey was to be the reverse of the outward and we turned ourselves back to the portacabin, the reservoir dam and the new house at Craigendunton. There is a cave supposedly used by hunted Covenanters in the banks of the Calf Fauld Burn some hundred yards off the road and we turned our steps along the burn side in search of it. Jimmy found it carved into the rock fifteen feet up a crag face with a wet, slippery ascent to the mouth. It was too wet and too slippery for us today and an exploration of the cave must be left for another time. April? When we left the cave and came back onto the track, the air was drying and the day was clearing somewhat, clearing enough to let us see the potential of the area. Away in the distance was Brown Carrick hill and a glimmer of light that showed the sea. Yes, we must do this walk on a better day. Back down through Airtnoch we came and back to tarmac at Kiwi Lodge. This tarmac brought us back to waterside just the late end of lunch time, just in time to enjoy FRT in the King’s Arms in Fenwick. The boy is getting home today. The hat needs further treatment! I'm just back from visiting Johnny and am glad to report that he is making an astonishing recovery. Little pain and is already on his feet and champing at the bit to get home. He is much, much better than he was at this stage after his previous operation. I've passed on the regards of the ooters and told him that we had to have chips on Wednesday as we had no-one to fold up our crisp packets. He said he could have done something with our chip plates!! He's in Ward 65 of the Southern General. I'll let you know any further details as soon as I know. Congratulations to Alan and Rex for completing their final Munro at the weekend and for raising an amazing amount for the Speur Ghlan charity. As we met at the car park at Sorn cemetery for the proposed walk from Muirkirk back to there, the rain, which had fallen continuously overnight, continued with a vengeance. Discussion ensued as to whether to do the walk, do the walk to the Haugh, or do the Lunky Hole walk round Muirkirk. The last option was agreed as it would be the least affected underfoot by the rain. Kaimes was soon reached and, having donned waterproofs, we set off on the well-established route (see 29 June 2011 for details) at about 10a.m. 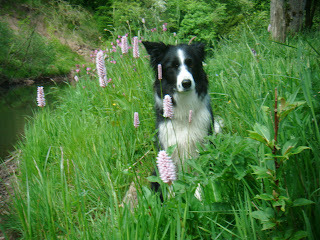 We had hoped that the rain would relent but we were wrong for it was to be dreich for the rest of the day. As we suspected, parts of the path by the river were well sodden and the wooden bridges had to be negotiated with care, but good progress was made until coffee was called for just beyond the memorial to the covenanter, William Adam. Here Davie C demonstrated how not to sit on a portable seat by falling off his not once but twice. At least he didn’t have far to fall. As there was little shelter afforded by the adjacent trees we didn’t wait long and were soon on our way again reaching the former opencast quarry - now a massive lake- just before half past eleven. Having then crossed the A70 we made our way through the heronry and up the minor road to where it meets the B743. Robert then suggested walking back down this road to where it meets the A70 and continuing straight back to Muirkirk. A sort of vote was taken- not a real ooters vote since Rex was there- and the majority opted for Robert’s suggestion despite having to walk down the main road. Quick progress was made back to the cars, and having changed into dry clothes, we went down to the Coach House where the ever-obliging barmaid allowed us to eat our lunches as we partook of FRT. The next time we are down there we are to phone ahead and she’ll make us pie and beans for a nominal charge, but only if we want to! The walk had only lasted 2 hours 40 minutes today but, given the conditions, it was long enough for most. Alan and Rex's final munro. The support group assembled near the Aonach Mor lift station. Rex and Alan with Emma and the Speur Ghlan poster. Finally made it in spite of the baltic conditions. Christmas lunch has been booked at the Ashoka at 1pm on Wednesday 19th December and deposit paid. The weather forecast had been poor with heavy rain expected and as we journeyed down to Durisdeer for the Morton Castle walk the rain got heavier and heavier. However, as we changed into our wet weather gear in the church, the decision was made to go at least as far as the bothy before reviewing the situation. The route has been described on previous blogs so suffice it to say that, given the conditions, we didn’t hang about (now there’s a surprise!) in making our way up the puddle-splattered track to the howff. As we dried out and, with Rex having started the fire in the stove, the steam rose and coffee/lunch was partaken amidst the haze. It is probably the earliest lunch stop we have ever had since we had started walking at about 10.15 and the trek had only taken about 40 minutes. 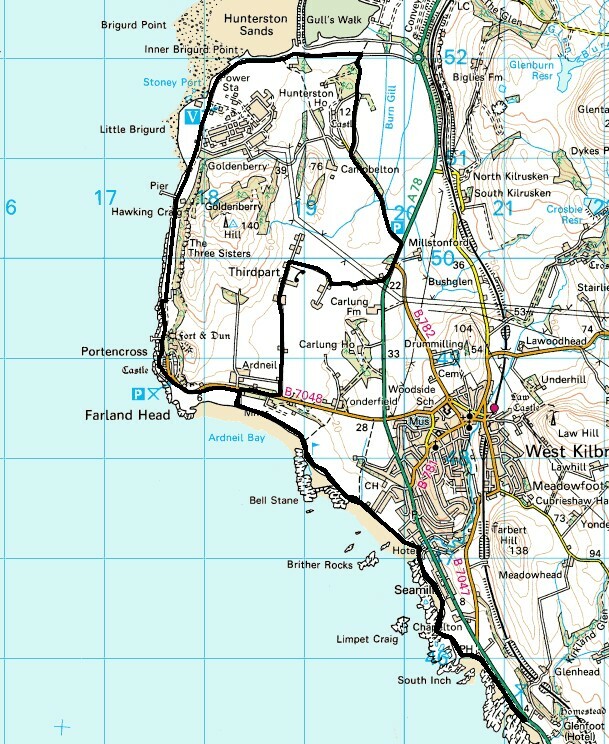 Most were of the opinion that we end the walk there and return to the cars whilst one or two (who shall remain nameless to protect their guilt) were in favour of continuing the circular walk. As we blethered and as Davie entered our details in the bothy log we were joined by two lads from Dumfries, Ryan and Nicholas, who, being self-employed window cleaners, had been washed out for the day and had come up to the hills for a walk. As Holly ‘greeted’ their big dug, a convivial conversation ensued and Ronnie took the opportunity to get his varifocals cleaned by experts. A miniature set of windscreen wipers will be fitted before the next wet walk. When it was time to bid them farewell we assembled outside the bothy where by this time the rain had almost gone off. 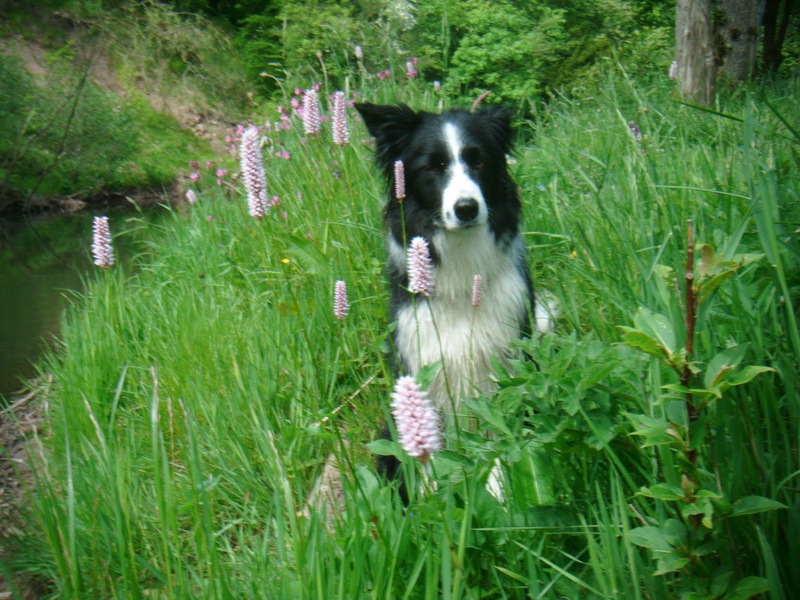 “Who’s for the circular walk to Morton Castle?” asked Jimmy. The silence was deafening. And so we returned down the track to the cars and dry clothes, although it has to be said that the weather had improved markedly on the descent. But, as our leader suggested, more heavy rain could not be ruled out. Our usual haunt in this neck of the woods is the Crown in Sanquhar and we hit our watering hole much earlier that we usually do. As always we find the atmosphere most welcoming and, as we supped up, the barmaid presented us with a large plate of lovely, hot sausage rolls. “There’s more on the way”, she said and before long a second one arrived. Brilliant! Many thanks for the hospitality! We’ll be back. Over the last year or two we’ve had stovies at the Mercat in Cumnock, shortbread at the Corner Bar in Lochwinnoch, our Ne’erday in the Black Bull in Darvel and scones at the Coachhouse in Muirkirk. With a welcome like those it’s no wonder we continue to support the wee local pubs. And to think that after spending a fortune at a recently done-up hotel in Arran they wouldn’t even give us some nuts for the table! Say no more!